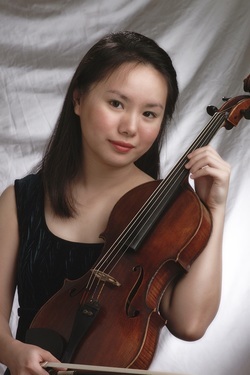 Violist Rachel Ku joined the viola section of the Philadelphia Orchestra as the youngest member of the Orchestra in September, 2004 at the age of 19. She has been studying viola since age eight and piano since age five, and made her solo debut in Taipei in 1995. She has since made solo appearances with the Mansfield Symphony Orchestra in Ohio, Rice University Chamber Orchestra, and the Curtis Chamber Ensemble. In January, 2005 Ms. Ku performed Hindemith’s “Der Schwanendreher” as soloist with the Delaware Symphony Orchestra as part of the orchestra’s subscription concert series. Ms. Ku has received several awards and honors, including first prize in the 2004 Delaware Symphony Orchestra Young Soloist Competition and second prize in the 2002 Riverside Symphonia Caprio Young Artists Competition. She was rewarded first prize at the 1997 Taiwan National Viola Competition, as well as second prize and fifth prize in the 1996 Taiwan National Viola and Piano competitions, respectively. During the summers she has participated in numerous music festivals such as Marlboro, Sarasota, Kneisel Hall, Taos, Angel Fire, International Music Festival in Saluzzo, Italy, and Encore School for Strings. She has collaborated as chamber musician with such artists as Kim Kashkashian, Steven Isserlis, Julian Rachlin, Chantal Juillet, David Kim, Arnold Steinhardt, and Marcy Rosen. Ms. Ku graduated with a Master of Music degree from the New England Conservatory studying with Kim Kashkashian and a Bachelor of Music degree from the Curtis Institute of Music as a student of Joseph dePasquale. She was principal viola of the Curtis Symphony Orchestra for the 2002-2003 season. In addition to teaching private lessons, she is also an adjunct faculty member at Cairn University and Temple University.